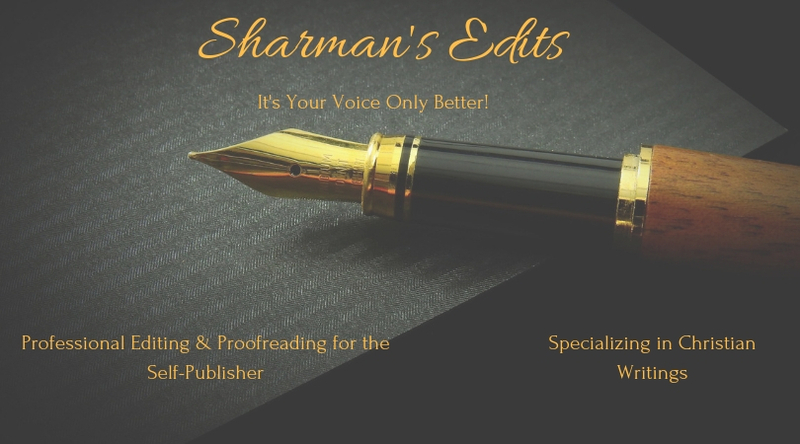 Sharman’s Edits – It’s Your Voice Only Better! PROFESSIONAL EDITING AND PROOFREADING SERVICES FOR THE SELF-PUBLISHER AND THE FIRST TIME AUTHOR . BUDGET FRIENDLY PAYMENT PLANS AVAILABLE. I am so excited to recommend this amazing young lady as one of the BEST editors on this side of the world! She is absolutely amazing at what she does and her work is outstanding. She edited my book in record time, communication was out of this world! Meeting Sharman was definitely a divine connection that will last a life-time. I must say that I have never met anyone who is as thorough and punctual as this lady. All I can say is that she is everything you will need in an editor and a friend! I was honored to work side by side with Sharman during my 6 weeks “Manifest Your Book Class”, where Sharman taught classes on editing tips, copyrights knowledge and so much more. The entire class took away valuable information from Sharman to assist and help them to complete their books. I am truly grateful for the gift that Ms. Sharman possesses, and look forward to her editing my 2nd book. I was very pleased with the editing Sharman did for my book. As a first-time author, I appreciated her honesty and confidentiality, as well as her knowledge and instinctive critique of word placement and flow. Sharman’s work will help make your work a literary masterpiece. 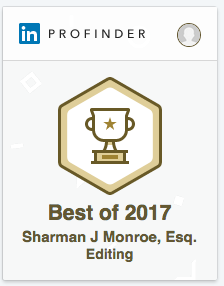 Sharman Monroe was the editor to my freshman writing, A Letter To A Father – All The Things You Want To Say, and I was astounded with her level of professional service. She provided expertise in areas that I was unsure of and was diligent until I was completely happy with my finished manuscript. It was truly an honor to work with such a wonderful person.